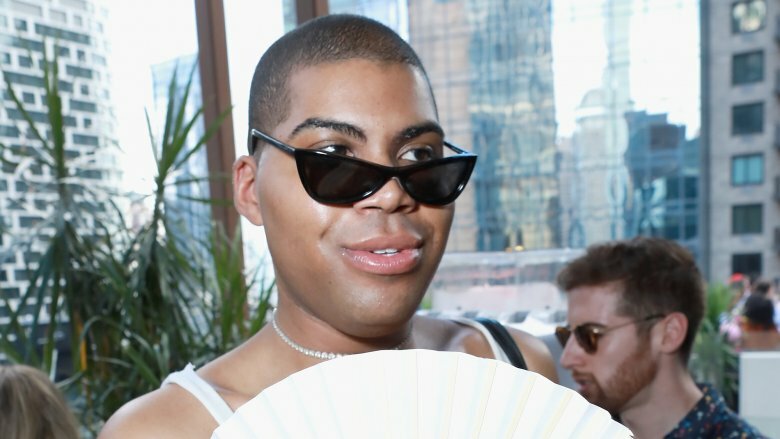 You've probably heard his name in the press at some point over the last few years, but what's the real deal with EJ Johnson? He's the son of NBA legend Earvin "Magic" Johnson, and growing up with a famous father has clearly made EJ a natural in front of the camera. "Obviously, my family's always been in the spotlight," he told Out magazine in 2014. "I've always loved being in front of people, being on stage and performing. I love the attention. I love everything about it." 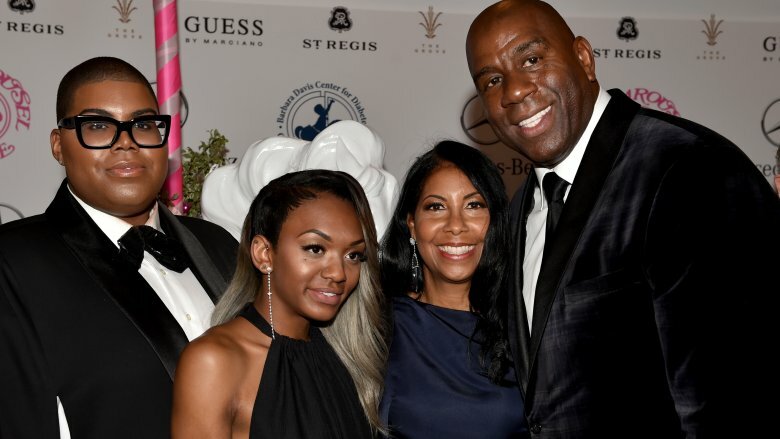 EJ, who turned 26 in June 2018, is the only biological father of Magic and his wife, Earlitha "Cookie" Johnson. They adopted a daughter, Elisa, in 1995. EJ is named after his father — the initials are short for Earvin Johnson III, but those are just the basics about this fascinating individual. Let's get to know the reality television star who served up a whole lot of drama on Rich Kids of Beverly Hills and his spin-off, EJNYC. 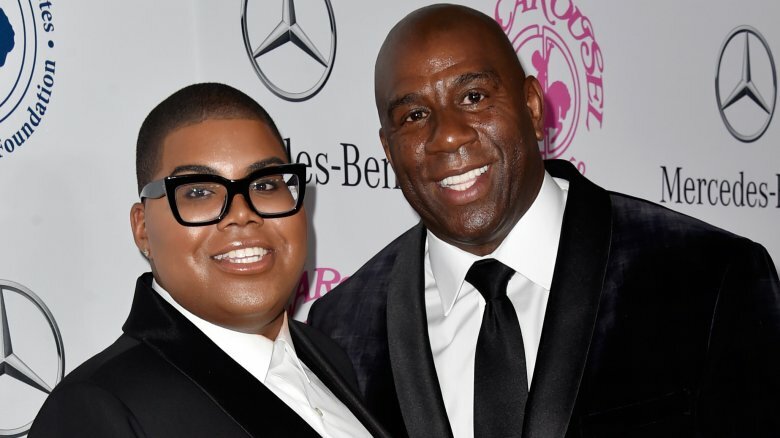 From fashion to racism to transitioning, here's what you don't know about Magic Johnson's son, EJ. EJ came out publicly as gay in 2013 after TMZ posted a video of him holding hands with his best friend, Alessandro Monetti, whom TMZ claimed was his boyfriend. Despite the aggressive tabloid outing, the 20-year-old took the experience in stride. "I always wanted to come into the spotlight," he told the YouTube talk show Gwissues (via ESPN). "I always had dreams and plans of doing my own thing and creating my own image, so it came a little sooner than I thought it would but this is still something I knew I would be going through and would have to experience." EJ said the reaction to his sexuality varied from positive to extremely harsh. Of his critics, he said, "It's almost like they're attacking me for being me and so to that I can only say, 'Well, I can only be myself, so I don't know really what you want me to do." When the TMZ story broke, Magic issued a statement: "Cookie and I love EJ and support him in every way. We're very proud of him." "I am very, very, very blessed to have the family that I do," EJ told Gwissues (via ESPN). "…When it was time to come out, I was, obviously, scared as most people are. After I got all the love and support from my family then I knew I could go out and conquer the world, I guess." EJ said he came out to his mother around age 13 or 14. "I told her how I was feeling and she obviously told me that she had known and always would love me anyway. The same thing happened with my dad like a year or so later. Everyone has to get used to it. No parent is prepared 100 percent and fully for something like that. We all had to work and move forward." 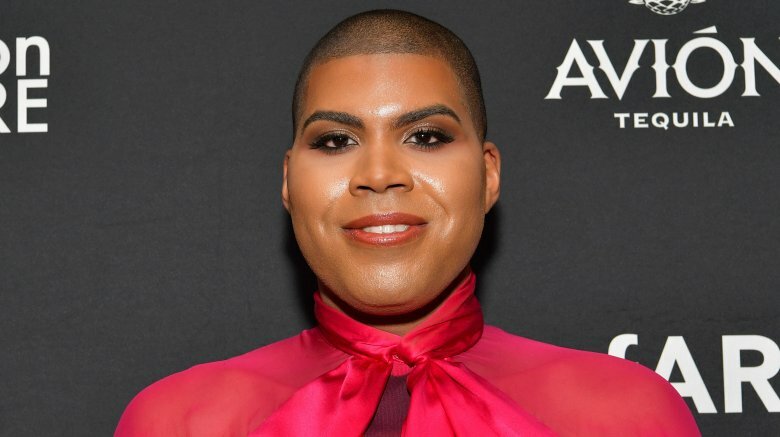 On an episode of EJNYC, EJ Johnson admits to a therapist that he considered transitioning into a woman after Caitlyn Jenner made her debut in 2015. "I've always been very fashion-forward," he says (via Us Weekly). "I've always definitely mixed men's and women's fashion in my life, but I never thought that it would raise so many questions about my own gender. I never really thought it was under investigation. Sometimes it's hard being in the middle, kind of in the gray area in my own lane. Now, since everybody's talking about Caitlyn Jenner and being transgender, people are so quick to say, 'Oh, just because you're dressing like that means that you're going to transition to become a woman.'" According to Us Weekly, some fans wondered if EJ was thinking about transitioning after he wore what appeared to be the same dress as Kim Kardashian to a wedding in May 2016. "I thought about it, for sure," he says. "I was just like, 'Well, do I want to transition? Is this something that I would do?' But I don't feel incomplete in that way. I don't feel the need to do that." According to E! 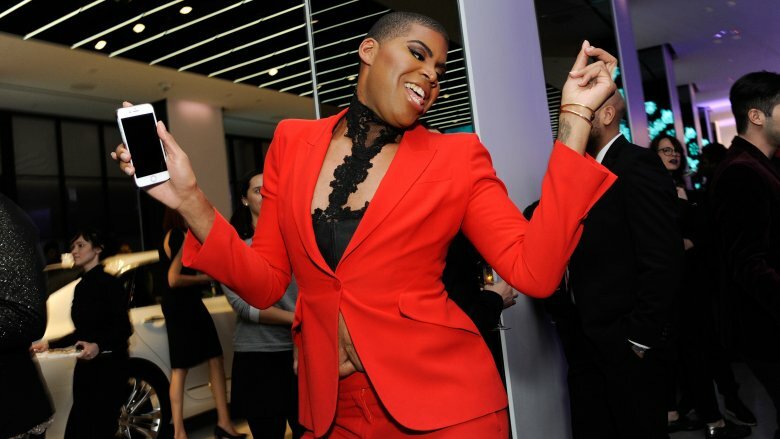 News, EJ Johnson once weighed about 360 pounds but underwent gastric sleeve surgery in early 2015. He revealed on the season finale of Rich Kids of Beverly Hills that he'd lost about 180 pounds since the procedure. "The surgery was definitely the best thing that ever happened to me," he says. "I never thought that I'd look this good, and that is the God's honest truth." "It's a totally new mindset," EJ told Page Six. "I'm completely dedicated to living a new, healthy lifestyle." He also discussed his diet. "I really think it's important that you not listen to so many fads; you really need to find what works for you," he said. "But that doesn't mean you're done after that because you don't like what's hot. You need to get creative." 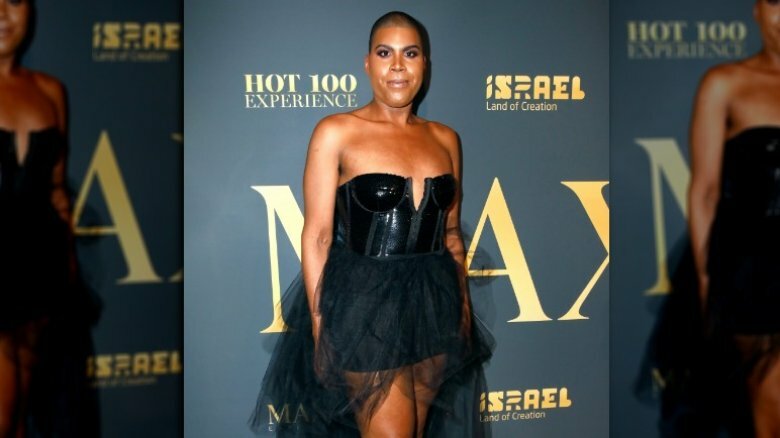 EJ Johnson got candid with The New York Times about his sports star father's very public battle with HIV, which began when his mother was two months pregnant with him. Of course, the revelation about his father's diagnosis — said to be the result of an extra-marital affair — led to a significant period of turmoil for the family. However, despite the frenzied headlines and strained family dynamic, EJ was not even aware of his father's illness until he learned about it by accident after stumbling upon a reference to his father while researching a book report in elementary school. "The school called my mom and was like, 'We don't know if you want him to do the book report, because it talks about the H.I.V.,' EJ said, adding, "I think it was at that point that they told me that he had been sick and he's a lot better." According to The Associated Press, EJ attended New York University, majoring in "event management and design with an interest in fashion, journalism and media." As a junior at NYU, he was cast in the first season of E! 's Rich Kids of Beverly Hills. 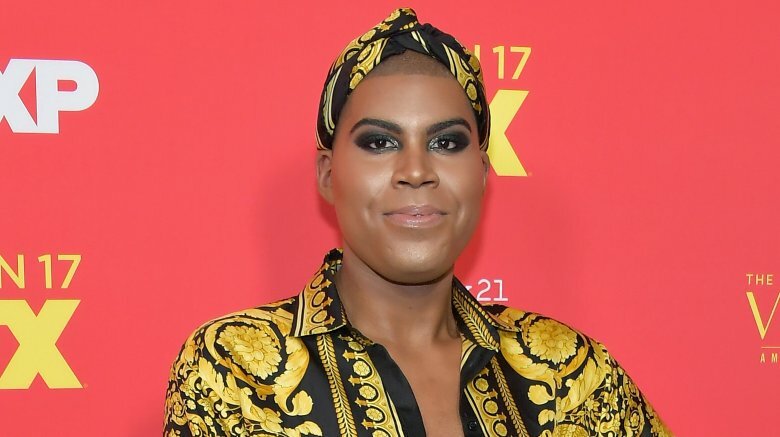 After four seasons with the rich kids, appearing on Fashion Police, and working as a special correspondent for red carpet events, the network gave EJ Johnson his own spin-off reality show called EJNYC. Originally titled EJ and the City, the series followed Johnson, sister Elisa (pictured), and their high-class crew living their best lives in the big city. Some memorable clips from the show include the time EJ reveals that he hooked up with a dude Elisa was dating. "I was told not to say anything about him kissing me, but he did, it happened," EJ says (via the Daily Mail). "The man that led me on is now hooking up with my sister, and I'm supposed to be OK with it." According to BET, the show was "not completely ratchet with hair pulling and fighting," but let's be honest, it wasn't exactly Masterpiece Theater, either. 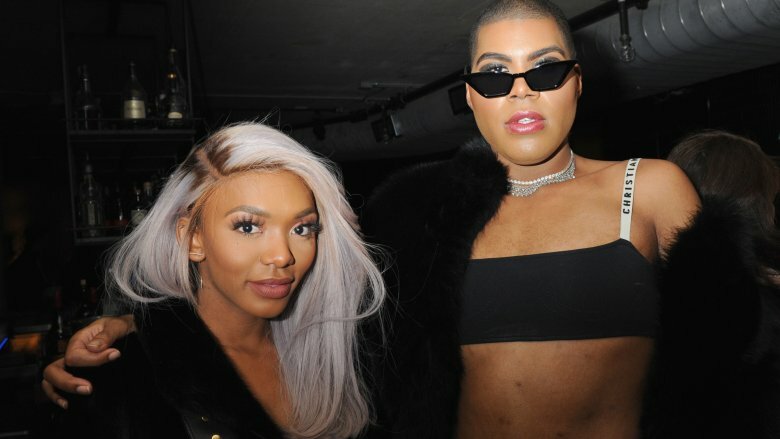 In an interview with The New York Times, EJ Johnson shed light on what went wrong with EJNYC, which lasted just six episodes. He was unhappy with how the show "portrayed him," saying, "I don't even recognize that person. It was sad. It was, like, this is supposed to be my show and my moment, and it wasn't what I wanted at all. I mean, I looked good, but that was just me doing me." EJ singled out the show's producers. "Everyone was just worried about me being 'relatable,' and even that word made me want to gag." Rich Kids of Beverly Hills was simultaneously canceled. An insider told Entertainment Tonight, "The cast was upset because they wanted at least one more season to give closure to their storylines," but it sounds like EJ was certainly ready to be done with all things E! at that point. 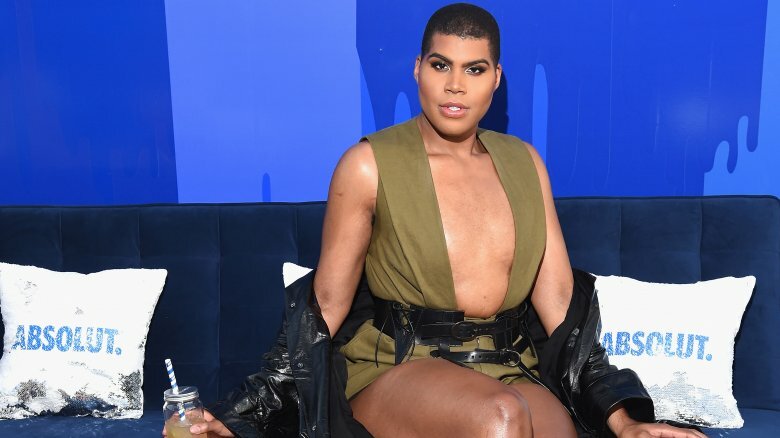 EJ Johnson is thinking about taking a stab at the fashion industry. Already a trailblazer who's been challenging long-standing gender stereotypes when it comes to his attire, EJ is now "contemplating starting a fashion collection," according to The New York Times. When asked about the fashion industry's embrace of "androgyny," EJ said, "I don't think the fashion world has made any type of major huge strides, where we need to start commending anybody yet. They should probably start highlighting people who are doing it in the streets, as opposed to whatever celebrity they're putting in a skirt for five seconds just for publicity." As for Louis Vuitton using Will Smith's son, Jaden Smith, in its women's line, EJ said, "If you're going to do it, I think you should go with somebody who's actually doing it because they genuinely get it as opposed to somebody who just has a name and was doing it just to be out there." Oh, snap. EJ told BET that racism hasn't been a significant problem in his life. "Yeah, racism, not so much. We've come across little random tidbits maybe, obviously when I'm in different parts of the world and other countries, things are different … Here [in the United States] I do not experience that much racism, I feel like that's probably more prevalent before I was born." It was an arguably tone-deaf remark for the otherwise media-savvy fashionista, particularly since he was so outspoken about the Donald Sterling controversy that inadvertently ensnared his father. To recap: during a bizarre interview in 2014 with Anderson Cooper, Sterling — the former owner of the Los Angeles Clippers who was banned from the NBA for life for making racist remarks — said Magic "should be ashamed of himself" for contracting HIV. "We were just so astonished at the things he was saying, and not just that he brought my dad into it, but the fact that he was being just blatantly racist. It was kind of like an 'aha moment,' the realization that people like that still exist," EJ told the Daily Beast in 2014, adding, "He's a walking joke." EJ is aware that as a public figure who is a member of two minority groups, he has a responsibility to be a role model. When talking about his position as the Celebrity Grand Marshall of the San Francisco Gay Pride Parade, EJ said, "Whether it's the African-American community, or in my case, the gay community, it's important to make sure that we represent those communities in a positive way." According to BET, he recognizes how lucky he his to be able to live freely as "a young Black man in the public eye who plays with gender norms." EJ said, "I'm fortunate that I'm in a world where I can do what I want to do and walk down the street in whatever I want to wear and break those walls down." EJ also gave advice to closeted young people who might be looking to his lifestyle as a road map for their own. "I say dance around in your closet when no one is looking until the time is right," he told BET. "…I think that if getting out is really the only way to be able to live your life then that's something to think about … also just make sure you're safe. That's something my dad always told me: Make sure you check your surroundings and be you, do you, but make sure you're not putting yourself in dangerous situations where you could get hurt."